The end of the holidays after the long hot summer in the northern hemisphere will this year again result in traffic jams on freeways. But such predictable jams could soon be a thing of the past. 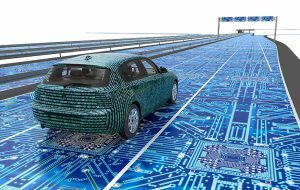 “In a few years, connected driving will allow traffic to flow better even at peak times,” Klaus Landefeld, Board Member at eco – Association of the Internet Industry, is convinced. More and more cars are connected to each other and their environment over the Internet, they are capable of self-driving, and they make efficient and safe traffic flows possible. “The goal is to develop a traffic eco-system supported by Artificial Intelligence, in which vehicles can be permanently in motion,” Landefeld says. But until we get there, there are technical hurdles to be overcome: “For connected cars to unfold their full potential, we need networks that fundamentally differ from those that we use today,” Landefeld continues. The mobile Internet is currently not broadly suitable to connect vehicles reliably and quickly so that they can communicate with each other and with the transport routes. Via the Internet protocol, vehicles will also potentially exchange information independently with traffic lights, road signs, and the street itself – for example, regarding road conditions, the current traffic situation, or road works. A further challenge is the reaction time: To coordinate self-driving cars and control the flow of traffic, high levels of computing power are needed, which needs to be available quickly and reliably. “Transferring all data initially to a distant cloud data center, analyzing it there, and transferring the results back takes far too long. Every hundredth of a second counts,” according to Landefeld. For more information on infrastructure for connected and self-driving cars, see the Klaus Landefeld interview on the topic in dotmagazine.